Length Info: The first day is a 45 minute lecture demonstration (in-gymnasium performance). The second day is a 90 minute workshop. We have also combined the workshop days and now offer a 2.25 hour master workshop (in one day) as an option. Availability: DATES AVAILABLE: October 2018: 4, 5, 17, 18, 19 November 2018: 7, 8, 9 December 2018: 6/7 & 12/13/14, January 2019: 16, 17, 18, 30, 31 February 2019: 1, 6, 7, 8 May 2019: 16, 17, 29, 30, 31 June 2019: 5, 6 *Because we are traveling from NYC, we have also combined the workshop days and now offer a 2.25 hour master workshop (in one day) as well. This option is preferred for scheduling & potential weather rescheduling purposes. Alternative dates have been made available for weather-related or emergency rescheduling. To be discussed closer to the booked workshop date, if necessary. Grade 5: Speaking & Listening: Comprehension & Collaboration: 1. Engage effectively in a range of collaborative discussions (one-on-one, in groups, and teacher led) with diverse partners on grade 5 topics and texts, building on others’ ideas and expressing their own clearly. c. Pose and respond to specific questions by making comments that contribute to the discussion and elaborate on the remarks of others. Grade 5: Dance: Performing: Anchor Standard 5: Develop and refine artistic techniques and work for presentation. c. Collaborate with peer ensemble members to repeat sequences, synchronize actions, and refine spatial relationships to improve performance quality. Apply feedback from others to establish personal performance goals. Grades 6: Speaking and Listening: Comprehension and Collaboration #1: Engage effectively in a range of collaborative discussions (one-on-one, in groups, and teacher led) with diverse partners on grade 6 topics, texts, and issues, building on others’ ideas and expressing their own clearly. c. Pose and respond to specific questions with elaboration and detail by making comments that contribute to the topic, text, or issue under discussion. Grade 6: Speaking and Listening: Comprehension and Collaboration #2: Interpret information presented in diverse media and formats (e.g., visually, quantitatively, orally) and explain how it contributes to a topic, text, or issue under study. Grade 6: Dance: Performing: Anchor Standard 4: Select, analyze, and interpret artistic work for presentation. A. Refine partner and ensemble skills in the ability to judge distance and spatial design. Establish diverse pathways, levels, and patterns in space. Maintain focus with partner or group in near and far space. Grade 6: Dance: Connecting: Anchor Standard 10: Synthesize and relate knowledge and personal experiences to make art. A. Observe the movement characteristics or qualities observed in a specific dance genre. Describe differences and similarities about what was observed to one’s attitudes and movement preferences. Grades 7: Speaking and Listening: Comprehension and Collaboration #1: Engage effectively in a range of collaborative discussions (one-on-one, in groups, and teacher led) with diverse partners on grade 7 topics, texts, and issues, building on others’ ideas and expressing their own clearly. d. Acknowledge new information expressed by others and, when warranted, modify their own views. Grades 7: Dance: Connecting Anchor Standard 10: Synthesize and relate knowledge and personal experiences to make art. A. Compare and contrast the movement characteristics or qualities found in a variety of dance genres. Discuss how the movement characteristics or qualities differ from one’s own movement characteristics or qualities and how different perspectives are communicated. Grades 8: Speaking and Listening: Comprehension and Collaboration #1: Engage effectively in a range of collaborative discussions (one-on-one, in groups, and teacher led) with diverse partners on grade 8 topics, texts, and issues, building on others’ ideas addressing their own clearly. d. Acknowledge new information expressed by others, and, when warranted, qualify or justify their own views in light of the evidence presented. Grade 8: Speaking and Listening: Comprehension and Collaboration #2: Analyze the purpose of information presented in diverse media and formats (e.g., visually, quantitatively, orally) and evaluate the motives (e.g., social, commercial, political) behind its presentation. Grades 8: Dance: Performing: Anchor Standard 4: Select, analyze, and interpret artistic work for presentation. C. Direct energy and dynamics in such a way that movement is textured. Incorporate energy and dynamics to technique exercises and dance performance. Use energy and dynamics to enhance and project movements. 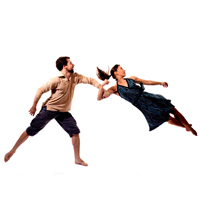 Grades 8: Dance: Connecting Anchor Standard 10: Synthesize and relate knowledge and personal experiences to make art. a. Relate connections found between different dances and discuss the relevance of the connections to the development of one’s personal perspectives.